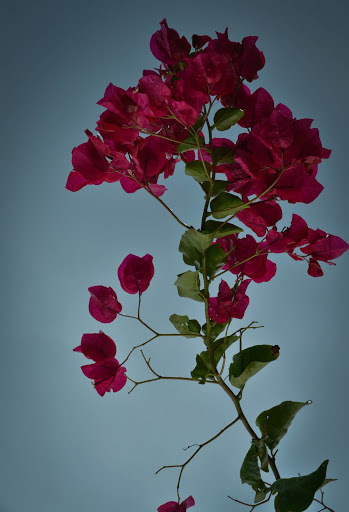 My flower is the Bougainvillea. What’s Yours?  and a promise for a third blossom of your choice. world. What will you choose? We suggest you think about it for awhile. Take a walk. Sniff the air. Ask the Universe what flower you may need on this particular journey. There’s power in those petals. I choose Bougainvillea because I like to say it: (boo-gain-VIL-ee-a) and because it’s a beautiful plant: colorful, complex and thorny like most of the women I know at the One Half Century Mark. The brilliantly-colored leaves (or bracts) are really its petals; the flowers are so small that you need to look very closely to even notice them. The thorns can draw blood. So much more there than first meets the eye, and so like life at the Hotel. I first chose B as my flower on a journey with my dearest friends and family in Feb. 2010. In addition to liking the sight and sound of the plant, I liked its history or what I thought was its history. I thought B was named by a French naturalist Dr. Philibert Commerson after his close friend and admiral Louis-Antoine de Bougainville, who commanded the ship that sailed around the world between 1766-1769, in which Commerson was a passenger. A friendship naming, according to my friend Wikipedia. This morning, however, my little bougainvillea world was turned upside down when I discovered Glynis Ridley’s new book, The Discovery of Jeanne Baret: A Story of Science, the High Seas, and the First Woman to Circumnavigate the Globe. “She was an herb woman: one schooled in the largely oral tradition of the curative properties of plants. Herb women were for centuries the source of all raw materials to be prepared, mixed, and sold by male medical practitioners, and as botany crystallized as a science in the eighteenth century, a handful of male botanists did not think it beneath them to learn from these specialists. In this light, Baret was not Commerson’s pupil, but his teacher.” – excerpt from The Discovery of Jeanne Baret: A Story of Science, the High Seas, and the First Woman to Circumnavigate the Globe, by Glynis Ridley. Who cares that a beautiful French peasant girl lived a real-life Cinderella tale, grew up to become a brilliant knower of plants, a world traveler, a teacher, a lover, forgotten and rediscovered? Who cares that our real-life Cinderalla was raped by the ship’s crew? Who cares that contradictions live within tropical plants or midlife women? Who cares how our thorns protect or our flowers can be so subtle? Who cares that beauty can lead you to seek knowledge and truth? Who cares? This morning, I do. I may forget tomorrow; that’s why I write this blog. The natural world is like a giant Sudoku book. It helps me stay awake and curious. Two essential states of being at the Half Century Mark…. so what’s your flower gonna be?